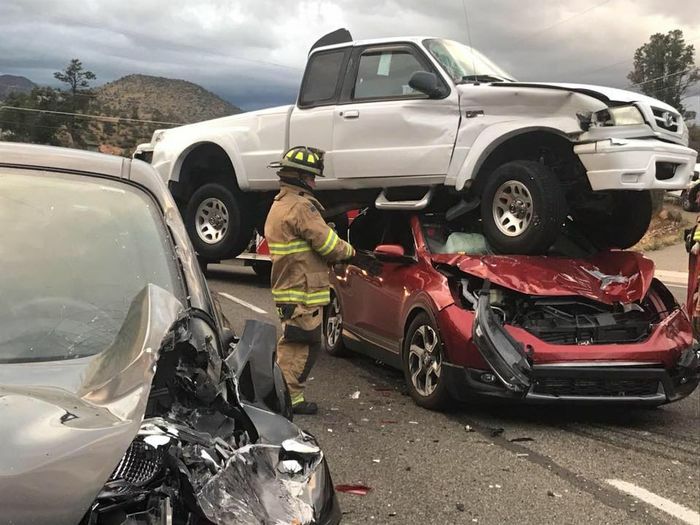 A bizarre accident in Prescott, Arizona has resulted in an image that’s sure to be used for one of those “ever look at something and wonder how it got there?” memes. 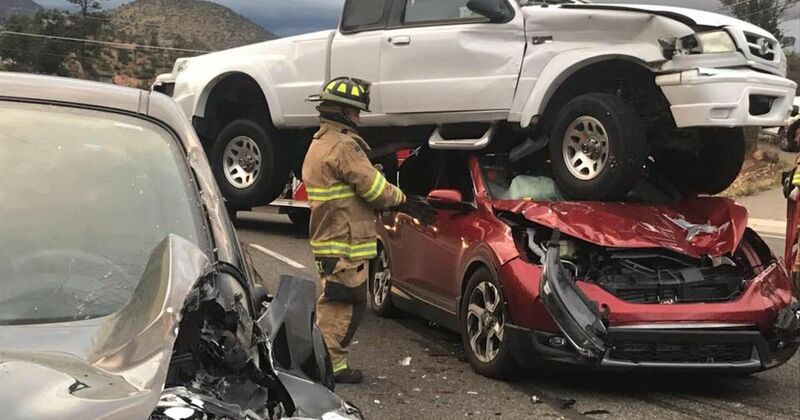 On Sunday night, the driver of a white Mazda B-Series told police that she lost control of her vehicle and ended up careening into oncoming traffic after being hit by another motorist in a black pickup. She struck the grey/black vehicle you see in the foreground of the image above, launching the Mazda in the air, which then landed on a Honda CR-V. Remarkably, both occupants of the Honda, the Mazda driver and the driver of the third vehicle escaped injury. The driver of the black pickup, meanwhile, left the scene. Prescott Police Department is now appealing for information surrounding the crash. The authorities noted that the wearing of seatbelts avoided what might have been a fatal accident, but the CR-V should be singled out for praise too - it looks to have held up incredibly well considering it ended up wearing a pickup truck as a hat. Sounds like pretty obvious advice, but with the seat belt use rate for passenger vehicle occupants sitting at 89.7 per cent in 2017 (according to NHTSA figures), plenty of road users still do without this potential life-saver.